In the twilight years of steam locomotive developement, the scale of the American main line engine was reaching epic proportions. Greater size and power meant stronger, heavier reciprocating machinery; increasing the destructive forces of weight imbalance and of pulsing thrust upon railroad plant. 'Duplex Locomotive' design divided the power delivered to the wheels by employing two pairs of external cylinders attached to a rigid frame. Primarily the advantages of this system are smaller, lighter machinery and cylinders with gentler piston thrust, resulting in less 'hammer blow' effect. 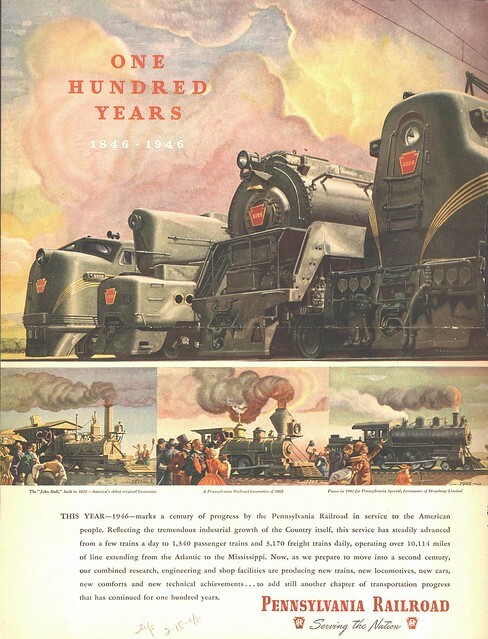 In 1939 Pennsylvania Railroad achieved a measure of success with it's experimental S1 Class duplex express passenger engine though it's extreme length limited it's practicality. In search of a powerful replacement for it's ageing K4s fleet, PRR commissioned Baldwin for a slightly more compact 4-4-4-4 duplex locomotive design with a Belpaire firebox and Franklin oscillating-cam poppet valve gear. A pair of prototype T1 Class locomotives was delivered to the PRR in 1942 sporting a distinctive, Loewy styled exterior that featured a long angled nose, lateral skirting and a shrouded pilot with 'buick style' portholes. PRR administration was suitably impressed with the T1's ability to move a long train at high speed for a sustained period and encouraged by the war production board it placed an order for fifty locomotives. Construction of the T1 fleet was split between Baldwin works and PRR's Altoona workshops and the locomotives entered service in 1945 - 1946. The production series was delivered with a revised exterior styling for increased practicality. Notable features were a shorter, blunter nose and minimal lateral skirting making the machinery more accessible. Like all the best streamlining it wasn't long before it came off and the front cowling was again revised as the class was modified to take it's final shape. While the T1 led only a brief career on the road, and while it was mechanically difficult, and while it's styling proved to be a case of form fouling function; the T1 remains one of history's most distinctive and memorable locomotives and continues to be a popular subject for modelers of many mediums. I will do Lord K.
Don's photos are also outstanding. please send my best regards to Mr. Henderson. Finally, I discovered his website. Excellent! Nice to see that you have added some artwork from Don Henderson,he is a very good friend of mine,and he its an excellent artist of nose art too. Nice post as for the violent wheelslip,well that would also depend on the railhead conditions as well. 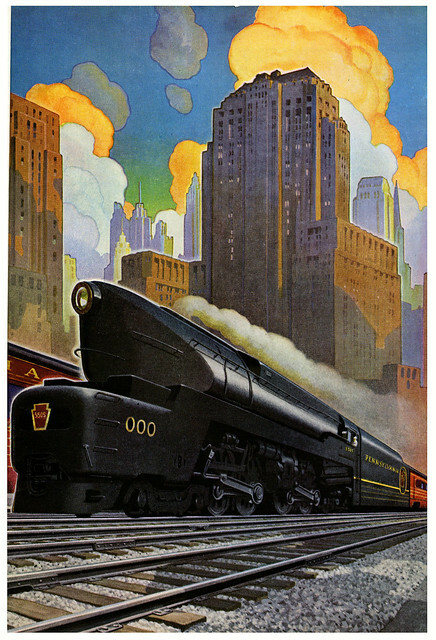 I love those Raymond Loewy designs. By the way, I live 40 minutes north of Altoona. The Railroaders Memorial Museum is located there.